AwayGoWe Posts » Family Travel » Guava Family Lotus Travel Crib: The Best Crib for Travel? Here now in 2019, it’s crazy for Lori and I to believe that we are well into our THIRD year of using the Guava Lotus Travel Crib as both a travel crib AND primary bed — first for our older son, and now with our younger son. True to its name, the Lotus Everywhere crib has literally followed us everywhere we’ve traveled — from beach bungalows on Borneo to hotels in China and Brussels, cabins in California’s Sierra Nevada, and beyond — not to mention it’s our son’s nightly cot here in Laos. We’ve definitely learned a ton about this travel crib along the way and want to share it with anyone who’s thinking about getting a Lotus Travel Crib as well. When Noe was born, we knew we were moving overseas (we just weren’t sure if we were headed to China or Laos, but that’s another story). Whatever the case, we knew we needed to get a portable crib that could also double as an ultra-portable infant bed, and eventually a portable toddler bed, too. The portable crib had to be lightweight and easy to setup and take down (for travel), yet sturdy enough to be our son’s full-time bed. Oh, and it needed to be reasonably priced. That was about it. After considering the usual portable crib suspects, and some more obscure travel crib offerings, we decided on the Guava Family Lotus Everywhere Travel Crib. 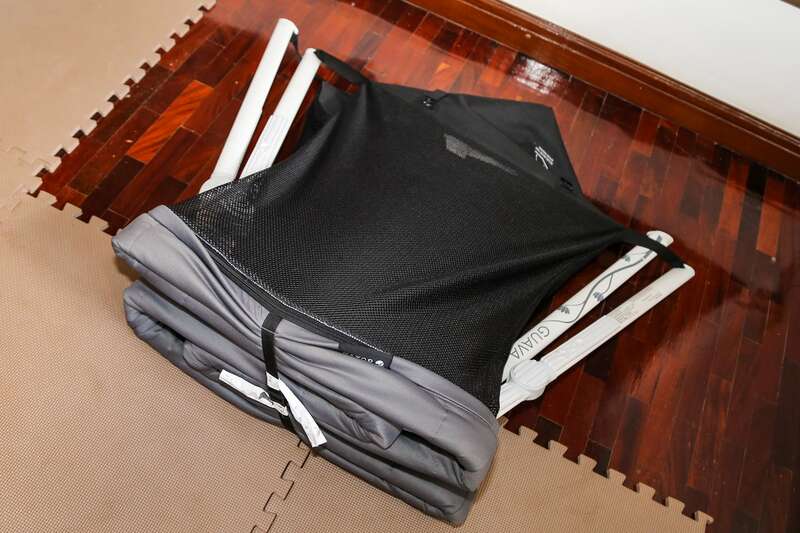 What ultimately sold us on the Lotus travel crib (in addition to quality, price, and positive reviews) was the compact size, side zipper door, and backpack straps. So, how do we feel about the Lotus travel crib 2 years on? We wouldn’t swap it for anything else! The Guava Lotus travel crib has been everywhere with us—and when I say “everywhere” I mean it. 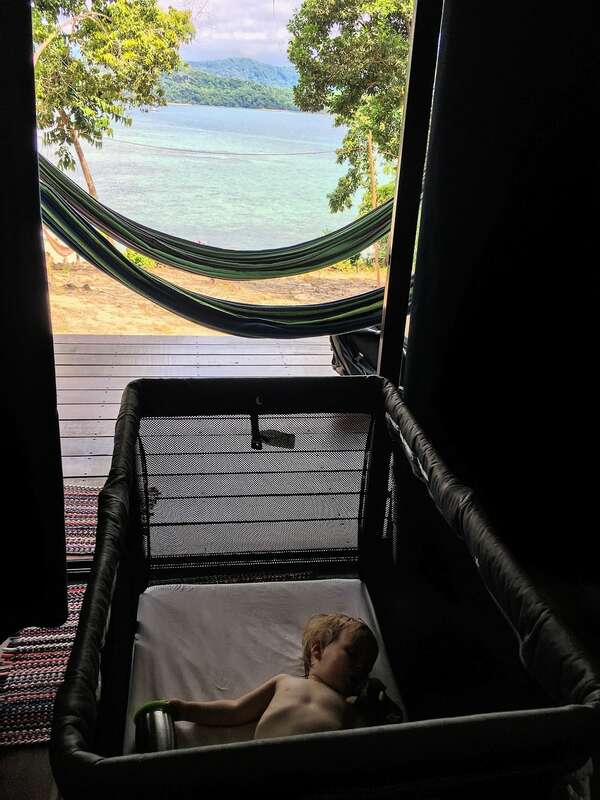 We moved to Laos when Noe was three months old, and—with the exception of a handful of nights in the hospital (yet, another story)—he’s spent every night in his portable travel bed ever since. 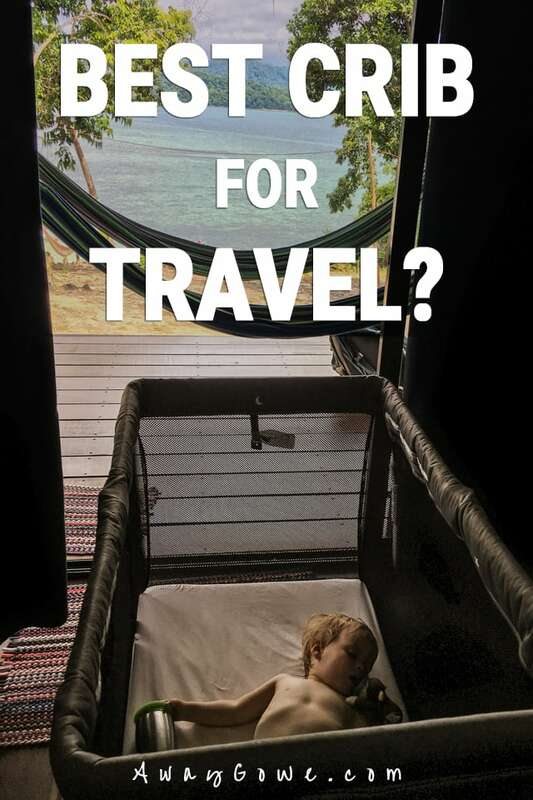 That includes exploring Borneo, backpacking in northern Laos, and bungalows throughout Thailand—countless flights, buses, and boats along the way—and our son’s portable crib was traveling right there alongside us. I’m happy to report that after all this time (I must have setup and taken apart the crib 50 times by now), this crib is still solid as a rock. And most importantly, Noe sleeps soundly. Sleeping soundly in Chiang Mai, Thailand. Based out of a Borneo beach bungalow. When I first took the Lotus crib out of its package, it initially took about ten minutes to figure out how to assemble and disassemble the thing. 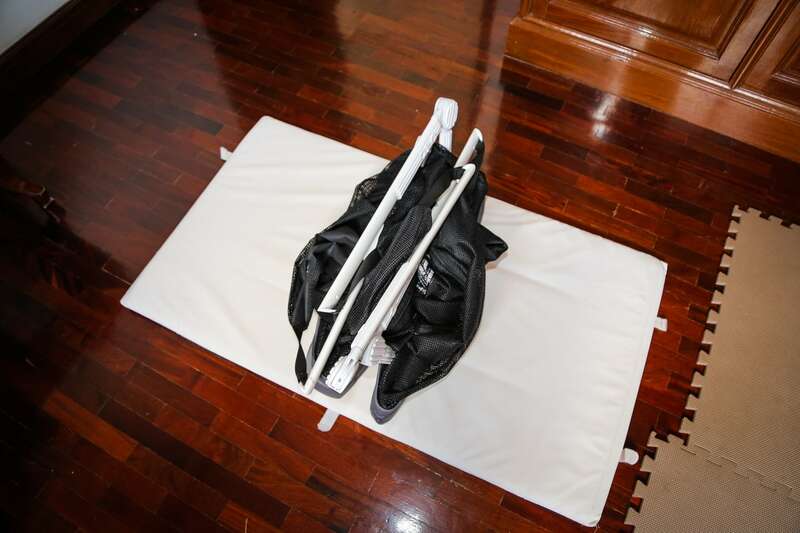 Now, it takes me about three minutes to set up and a minute to collapse and put the travel crib in its carrying case. It would actually take me a fraction of that time if it weren’t for the six velcro tabs that hold the sheet and pad securely in place. But it’s nice to know that no matter how hard Noe tugs on it or rolls around, that sheet ain’t going nowhere. If Guava Family did happen to come up with a quicker-release system that didn’t sacrifice the sheet and mattresses firm connection to the rest of the rest of the travel crib, I’d be very happy. 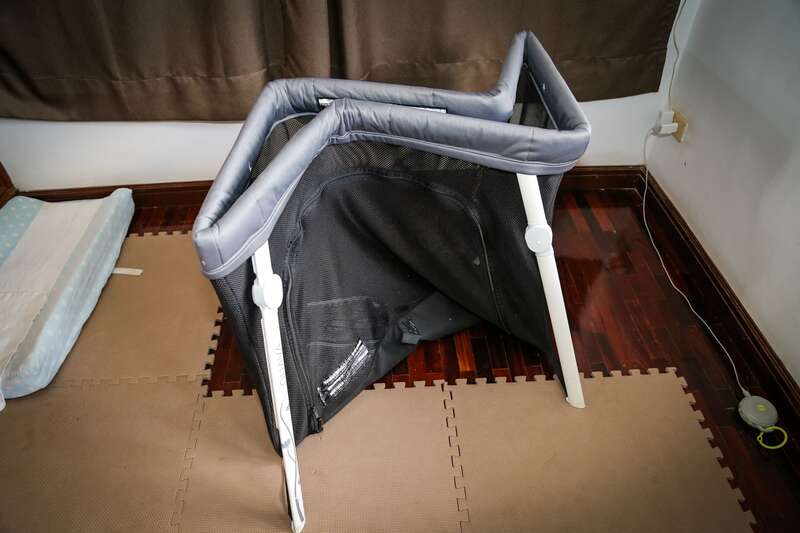 On the other hand, if I couldn’t even spare 1-3 minutes to get this thing setup, setting up a folding portable crib for a toddler is probably the least of my issues. I’ve included the diaper here, not so much to add some flair (though I do think it adds a nice little touch … of realism, that is), but rather to add some sense of scale of how compact the ol’ portable crib is. In other words, the Lotus travel crib folds up to a pretty compact size (though you probably won’t get away with putting it in the overhead bin on today’s flights). With that said, if you are lucky (i.e. not on a domestic flight in the U.S.), chances are your airline still allows one free checked-in bag (even for your lap baby!). For every other mode of transport—cars, trains, boats, camel—you should have no worries. 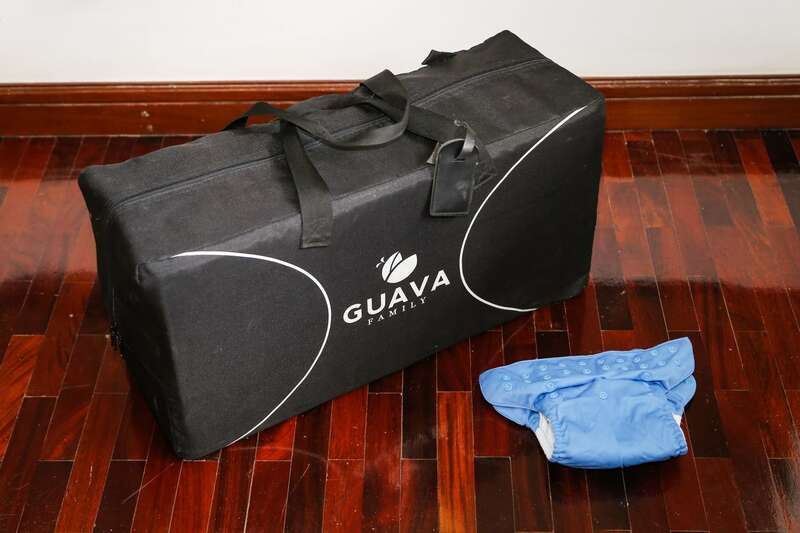 The Guava Lotus travel crib has a number of helpful features that we like. 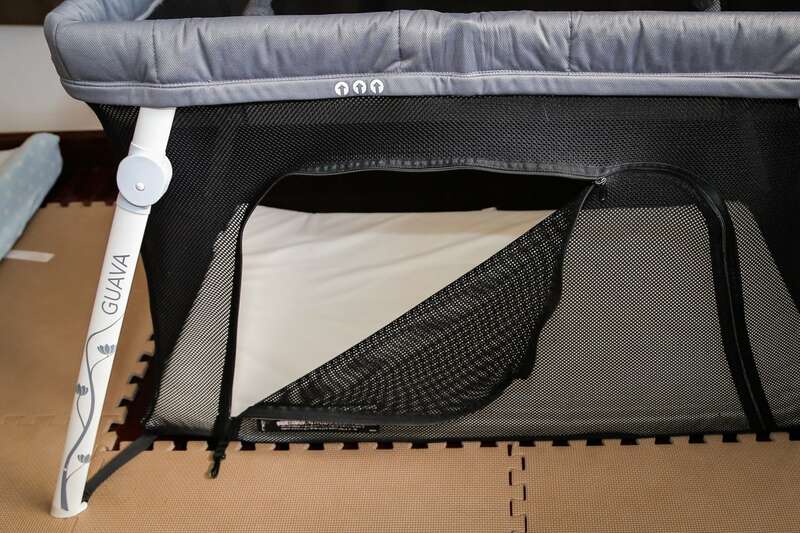 In addition to its excellent portability and strong, yet lightweight construction, the portable crib is really easy to clean—the whole soft shell zips off of the frame for easy machine washing, the vinyl pad cleans up spills and other nastiness easily, and the 100% cotton sheets are what you’d expect. 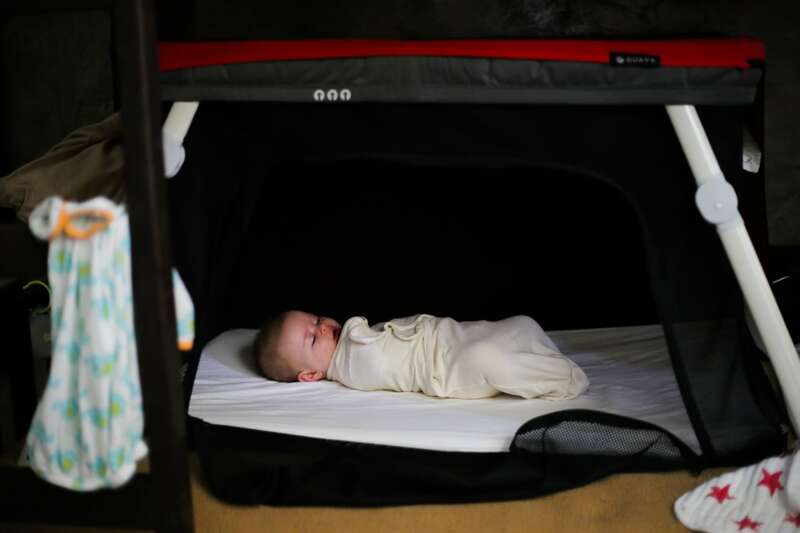 The Lotus travel crib does not come with the custom, fitted sheets (they are sold separately). Obviously, you’ll want at least one, but you’ll probably want a second as well…particularly if you plan on actually taking this travel crib, well, traveling (or happen to line dry your clothes like we do in Laos). 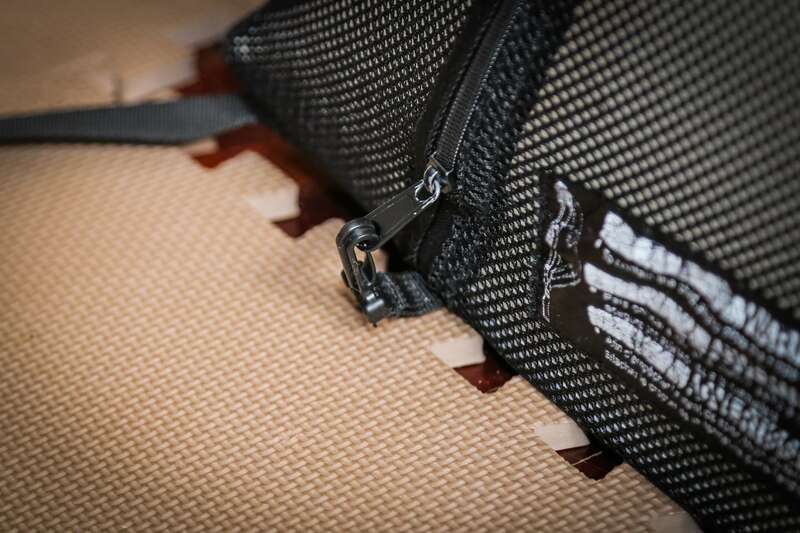 Guava Lotus Travel Crib side zipper. Guava Lotus Travel Crib side zipper locked. 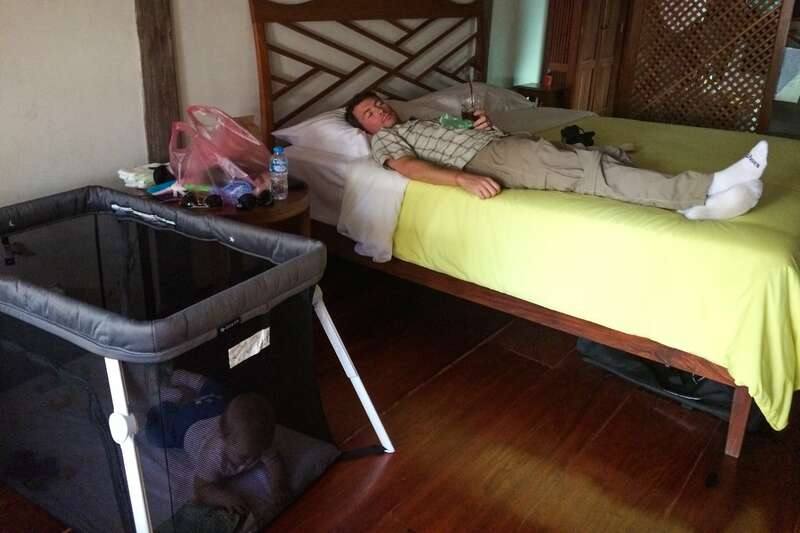 Daddy duty in Luang Prabang, Laos. 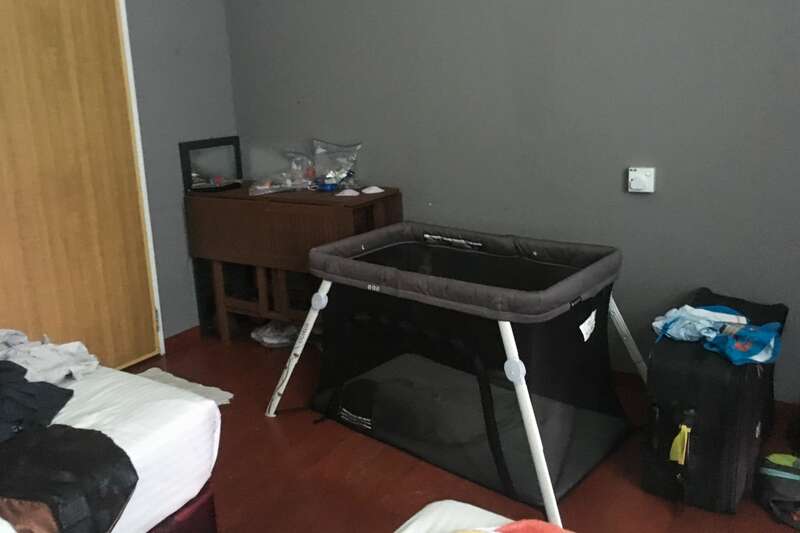 There are also a growing number of useful accessories for the Lotus travel crib, such as a “Fun Shade” for sun protection (and room darkening), and, more recently added mosquito net cover (we’re planning on picking up one of these when we’re back in the U.S.). Additionally, Guava Family offers a bassinet kit as well, though we didn’t end up needing it for Noe. All in all, for the price, the Guava Family Lotus travel crib might very well be the best travel crib for toddler or infant on the market today. Fun Fact: Using the above links to buy anything helps us keep the lights on and helpful travel tips coming your way, at no cost to you. Thanks!